Who is Getting Money from the NRA? In the wake of the latest mass school shooting, many are asking about the influence of the National Rifle Association (NRA), which is dedicated to blocking virtually all restrictions on firearms. The NRA has not been particularly successful in Maryland, where one of the nation’s strictest gun control laws was signed by Governor Martin O’Malley five years ago. But that has not stopped the NRA from trying to influence Maryland politicians by contributing money. 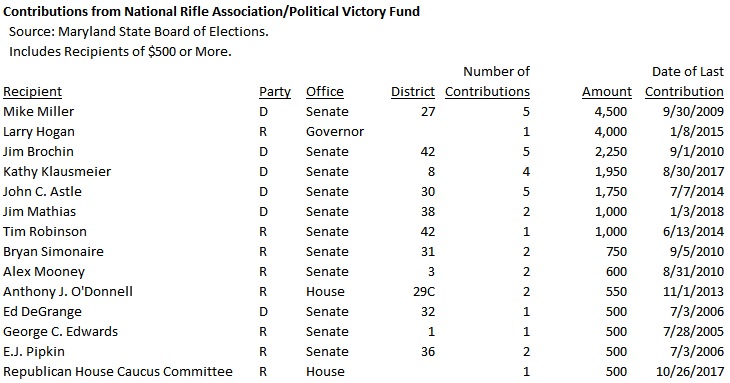 We looked up all contributions to state and local political committees in Maryland from the NRA itself and its PAC, the NRA Political Victory Fund, on the State Board of Elections website. We identified 49 contributions totaling $22,450 from the 2006 cycle on. Of that total, $12,300 (55%) went to Democratic committees and $10,150 (45%) went to Republicans. Fourteen committees received $500 or more and we identify them below. We also list the last date of contribution from the NRA; bear in mind that some folks on this list have not received NRA money in several years. All of the above candidates were incumbents except Tim Robinson, who ran as a Republican against Senator Jim Brochin (D-42) in 2014. Brochin was himself a former recipient of NRA money and is now running for Baltimore County Executive. Democratic Senators Kathy Klausmeier (D-8) and Jim Mathias (D-38) are facing tough GOP challengers this cycle and have accepted NRA money in the last year. Ten of the above recipients were in the General Assembly when the Firearm Safety Act of 2013, Governor O’Malley’s landmark gun control law, was passed after the Sandy Hook Elementary School massacre. Those voting for the bill included Senators Mike Miller (D-27) and Jim Brochin (D-42). Those voting no included Senators John Astle (D-30), Ed DeGrange (D-32), George Edwards (R-1), Kathy Klausmeier (D-8), Jim Mathias (D-38), E.J. Pipkin (R-36) and Bryan Simonaire (R-31) and Delegate Tony O’Donnell (R-29C). One more recipient of NRA cash stands out: Derek Hopkins, the Republican Register of Wills in Harford County, who collected $100 from the NRA in 2010. Perhaps this is unsurprising since mass proliferation of guns and the writing of wills seem sadly interrelated.